The most common misconception regarding fire doors is that if they are present in a property then the occupants are protected from smoke and fire. Sadly, this isn't always the case. An alarming amount of fire doors are poorly maintained and incorrectly installed in the first place, with essential fire doorset components commonly missed or incorrect/substandard versions being used. The harsh reality is that these uninformed decisions to cut corners can result in fatalities. Here we take a look at how you can ensure that your fire doors will perform in the event of a fire, and ultimately do their job to protect both lives and property. What are essential fire doorset components and why are they needed? 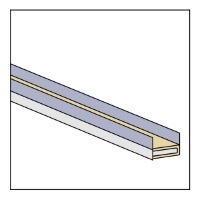 What is the purpose of Intumescent strips & Smoke Seals? What is fire tested ironmongery? What are the legal requirements for fire doors? How do you identify a good quality fire door? 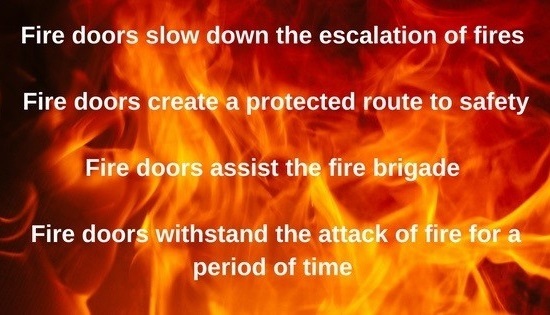 Who is responsible for maintaining fire doors? How do you spot a poorly maintained fire door? A properly fitted and maintained fire door can help to hold back a fire and restrict its development by slowing the fire’s passage throughout the building, as well as reducing the passage of smoke. Before fire doors are fitted, exit points and escape routes need to be identified. In accordance with Buildings Regulations, buildings are then to be split down into compartments to create protected escape routes via stairways and corridors. This will essentially buy the occupants enough time to escape in the event of a fire. 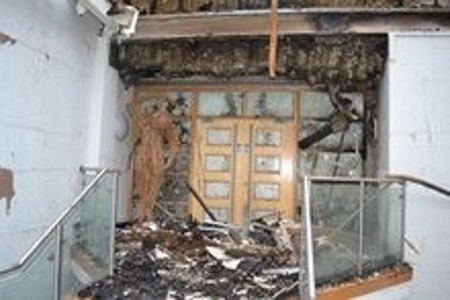 If the protected escape route is compromised due to fire doors failing, the risk to the occupants is greatly increased. Once the occupants of the building have been evacuated, fire doors should continue to provide a degree of protection (depending on the fire rating of the door and how far the fire has escalated) for fire fighters entering the building. When a fire door is closed, it will endure direct attack by fire for a specified period of time, giving an indicated level of protection. A fire door will offer a fire barrier ranging from twenty minutes onwards. A fire door will offer a fire barrier ranging from twenty minutes onwards, therefore, having the correct fire door in the correct location within the building is critical to maintain the occupants’ escape routes. Essential fire doorset components are part and parcel of what makes up a fire door and are ultimately essential to its successful operation. 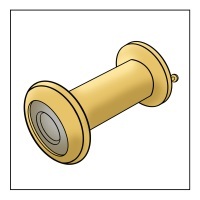 These additional components help the fire door perform to its certified requirements. Including them as part of the installation is the only way to ensure that the fire door does its job. If you have any questions relating to components you are wishing to fit to a fire door, please contact the door manufacturer for advice and guidance. When exposed to heat, intumescent seals expand to several times their original size, sealing the gap between the door and the frame holding the door securely in place and ultimately helping the containment of the fire. 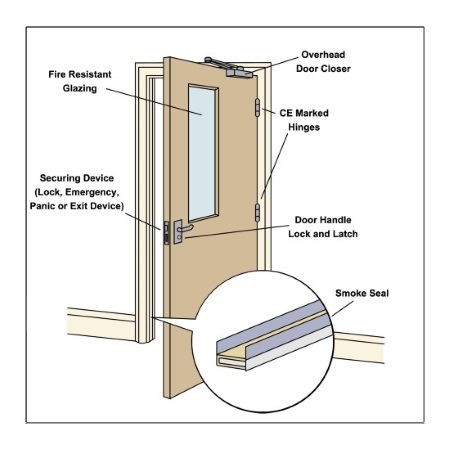 Properly maintained seals can reduce smoke penetration to almost zero, until the door assembly reaches the point when it can no longer withstand the fire (as per the designated fire rating). Normal non-fire rated glass will not withstand heat and is likely to break and fall out quite quickly in the event of a fire. As a result, it is essential that a fire door is fitted (and tested) with fire resisting glazing that is specially designed to withstand extreme heat. The glazing system also needs to have been tested with the glass type being used, within the door construction type it is being fitted into. Glazing systems are developed and tested to work with different fire rated glass and door characteristics to achieve its required duration. Mixing of these components (even if all termed as fire products) will jeopardise performance. Within commercial premises, correct signage is required on all fire doors. Signs should be placed on both sides of the door to clearly indicate that it is a fire door. If a fire door is open, it offers absolutely no protection against smoke or flames. 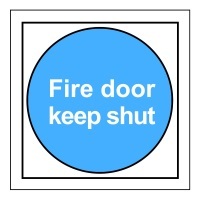 Therefore, it is imperative to use signage to indicate which doors are fire doors so that they can be kept shut, and ultimately, do their job in the event of a fire. 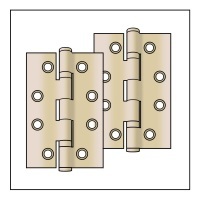 CE Marked Hinges – It is recommended to have at least three CE marked hinges on a fire door, positioned as directed by that particular door’s fire certification. A suitable hinge size is required to match the door weight and cover any imposed forces (door closers and extra wide doors, for example). 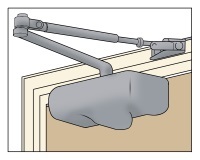 If hinges are not fitted or positioned correctly and cannot cope with the door weight, the fire door will be prone to movement and this could increase the perimeter gap sizes and even stop the door closing, making it not fit for purpose. 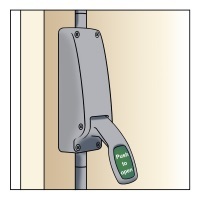 Door closing devices – Door closers ensure the door automatically closes after use. These could be in the form of overhead door closers, or as floor springs (refer to the fire door manufacturer’s fire certification). 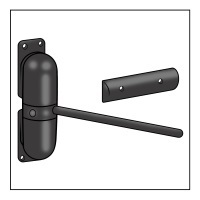 These devices will ensure that the door closes reliably and remains closed. 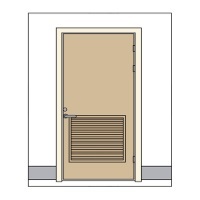 In order for the intumescent strips to react and expand accordingly in the outbreak of a fire, the fire door must be closed and hung snug within the frame. 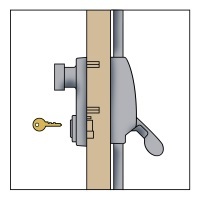 Locks and latches – It is essential that once a fire door is closed it remains closed. 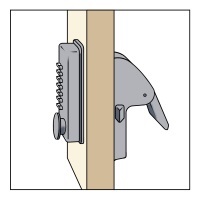 The latch needs to engage into the latch plate by at least 12mm to ensure that it stays in place if the door deforms due to high temperatures. 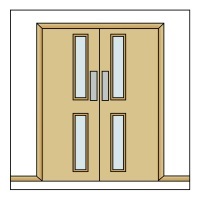 For 60 minute fire doors it is recommended that you select a latch with an extended flap and latch plate. 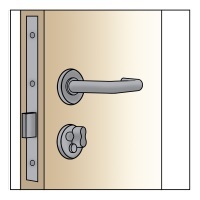 Although latches are generally strong enough to secure a door closed, they shouldn’t be relied upon for guaranteed closure in the event of a fire and it is advisable to fit an additional lock. Locks and latches need to be CE marked to BS EN 12209 and should be provided with additional product certification by an approved third party certification body. Fire Rated Door Viewers – When fitted correctly, with a collar of intumescent sealing material, a fire rated door viewer will not affect the fire rating of your door. Please note, that incorrectly fitted standard (non-fire rated) viewers may allow a passage for smoke and flames to enter through a fire door and will undoubtedly affect its fire / smoke control performance. Air Grilles – Intumescent fire grilles are required in areas where additional ventilation is required. They are designed to close automatically in the event of a fire, working to maintain the integrity of the overall fire regulated separation. Push bars – Push bars are designed to provide an easy emergency escape for people with little or no training in emergency procedures. This makes them the best solution for buildings frequented by the general public. Simply pushing on the bar will release the door, enabling an instant escape. 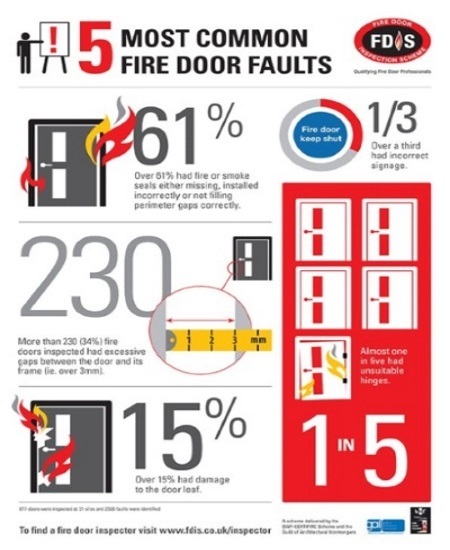 This infographic shows the most common fire door faults, highlighting the importance of the correct installation and maintenance of essential fire doorset components. This video, courtesy of the BWF, shows exactly what will happen if fire doors aren’t correctly installed. Domestic Dwelings Building Regulations specify that in homes over two storeys high, every door of a habitable room leading to a stairwell must be a fire door (this does not apply to toilets or bathrooms). Fire doors are also required between the house and integral garage (if applicable). Mixed Use Buildings Fire doors are required at the joining points between business and habitual residences. Non-Domestic Buildings As non-domestic buildings vary so much in size and structure, there isn’t a ‘one size fits all approach to fire doors. Fire door guidance is divided into two sections, based on vertical and horizontal escape routes. Click here for the Building Regulations for Buildings other than Dwelling houses. The traditional perception of fire doors is that they are ugly and cumbersome, with practicality far outweighing aesthetics. As a result, the stipulation for their presence in new build and renovation projects is sometimes regarded as a sticking point amongst architects and designers. Fire door design, however, has developed radically in recent years, and as Premdor’s stylish fire door range proves, the belief that fire doors are a design hindrance is a completely outdated view. 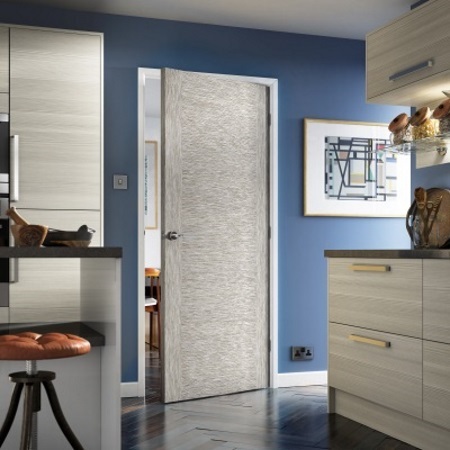 The wide variety of stylish and on-trend fire doors that are now available for both domestic and commercial settings, means that the inclusion of fire doors will not have any negative implications on the aesthetics of an interior. In particular, the Portfolio range of fire doors can be matched to their non-fire rated counterparts, keeping a consistent appearance, with only the necessary doors containing a fire resistant core. 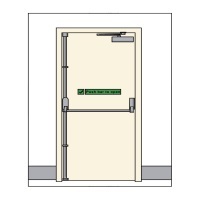 Doors come in all shapes, sizes and weights and it is easy to assume that any heavy door will provide adequate protection in the event of a fire. This, however, isn’t the case, and it is essential that you choose a reputable fire door manufacturer. When checking the certification of your doors, it is worth taking note of when the certification was actually carried out. Premdor doors currently offer the most up to date compliance certification meaning that a Premdor product meets all of the latest regulations. At every stage in the selection, installation and day-to-day use of fire doors, there are several measures that can be put into place to ensure that they can perform to their optimum ability. The question is, who is responsible for what? 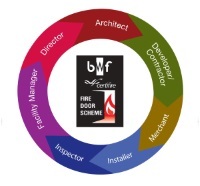 With this in mind, the BWF has devised a Circle of Responsibility, to highlight exactly what each particular individual in the process is responsible for. With the best will in the world, a professionally fitted fire door is only going to perform to its optimum ability if it is used and maintained correctly. Once a fire door has been fitted, it is essential that it is properly maintained and the BWF-Certifire recommends that fire doors are checked at least every six months, more if the door is in constant use. 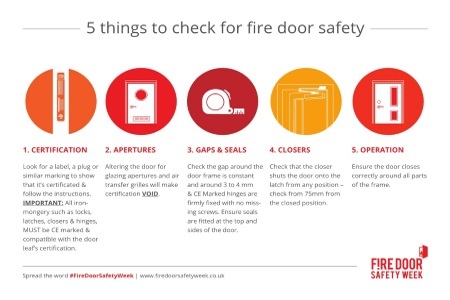 The fourth annual Fire Door Safety Week is now upon us, generating increased awareness of the importance of having properly installed and maintained fire doors. The focus for Fire Door Safety Week 2016 is on high risk areas in Houses of Multiple Occupancy (HMO). This includes private rented properties, social and council housing and care homes. Ultimately, FDSW will highlight how the correct usage of fire doors (from formally maintaining them to simply ensuring that they are properly shut and not wedged open), can save lives. “At Premdor we are proud to support Fire Safety Door Week as there can never be too much awareness when it comes to saving lives." He goes on to share his frustrations about how fitting standards need to match up with the quality of the product. Does the door close soundly against the frame? Are intumescent strips and/or smoke seals present and in good condition? Is the edge of the door or frame damaged? Does the latch engage properly? Are there any gaps larger than 3mm between the frame and the door? Is the gap at the bottom of the door greater than 10mm or 3mm on a smoke control door? Are there a minimum of three hinges and do they look in good condition? Does the door have the correct signage on it? If there is glazing in the door, does it look in good condition? Does the door closer (if fitted) close the door properly from all angles? Is the door wedged or stuck open? By investing in high quality fire doors, and ensuring that they are properly fitted and maintained, you will be doing far more than complying with Building Regulations. 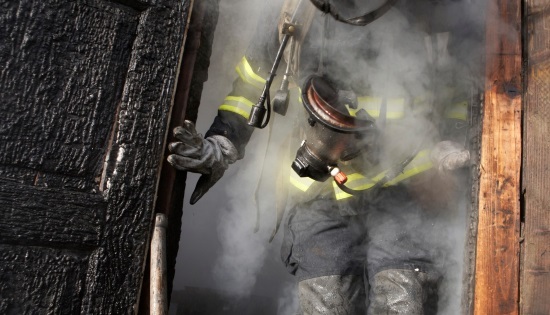 You will also be taking responsibility for the safety of all the occupants within the home or workplace, and ultimately preventing any fatalities in the event of a fire. Premdor is offering free fire door guidance and advice throughout FDSW. For further information, call 0844 209 0008 or alternatively, visit www.premdor.co.uk.